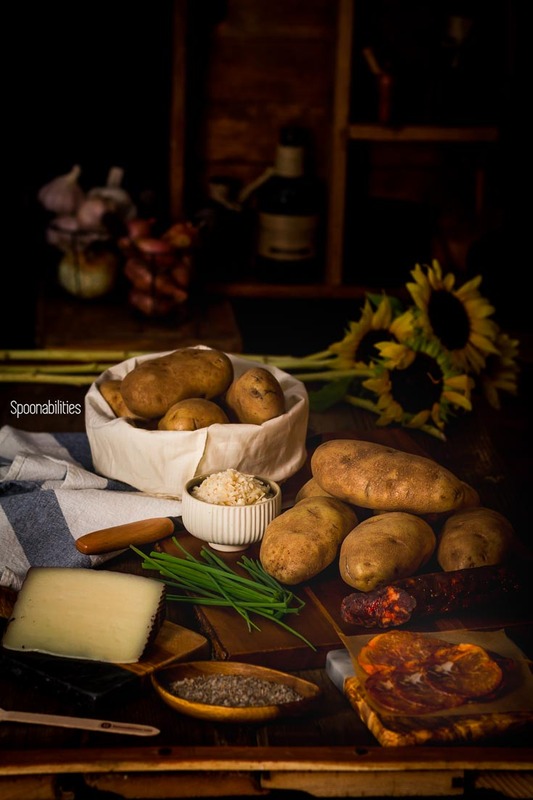 Spanish Style Baked Potato is a recipe inspired by the most famous, popular and traditional Spanish ingredients like aioli, manchego cheese, spicy ibérico longaniza chorizo sausage & Lomo Ibérico pork loin. Double baked, this baked potato is the perfect comfort food with a creamy and fluffy interior and crispy flavorful skin. The key to getting crispy skin is to cover the potatoes with olive oil and a flaky salt. Hello my friends. 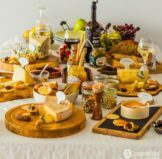 Last summer, I was inspired and created a photography session that I called “My dark studio & moody food photography creative process.” Could I make the title any longer? During this session, my goal was to practice things that I learned watching the Instagram stories of one of my favorite food bloggers from Spain, Raquel Carmona. I developed and photographed this Spanish style baked potato recipe, but it was never intended to be published. I was just trying to have fun and enjoy the creative process. However, the recipe turned out SO GOOD and the photos looked amazingly beautiful, so I decided to share them with you. 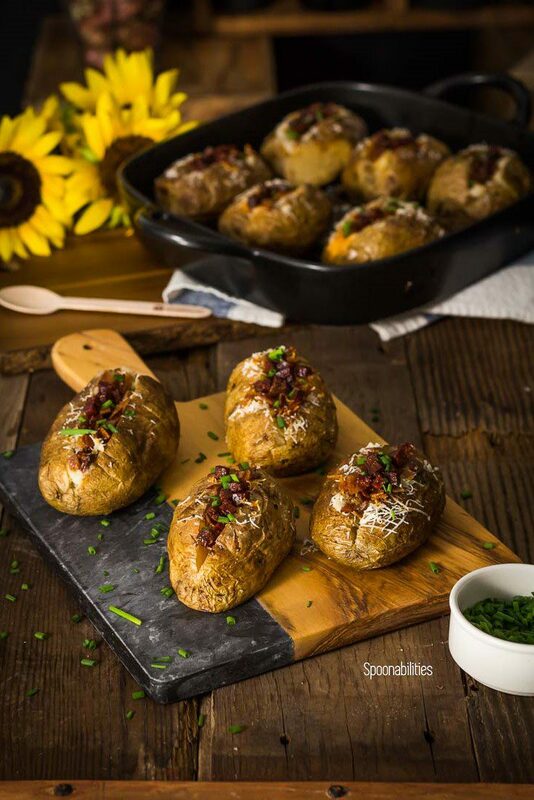 When I was developing this baked potato recipe, I wanted to be sure to include some of the most famous food from Spain like aioli, manchego cheese, spicy ibérico longaniza chorizo sausage & Lomo Ibérico pork loin. The combination of all these flavors in the baked potato is perfect! I have a small secret too. I also used all those ingredients because I already had them open in the refrigerator from our last charcuterie cheese party that we had with our neighbors. This is half the reason why this recipe was so easy for me to put together. As always, we leave “no jars left behind” or ingredients sitting in the refrigerator for too long. My specialty is creating amazing dishes with leftover ingredients. 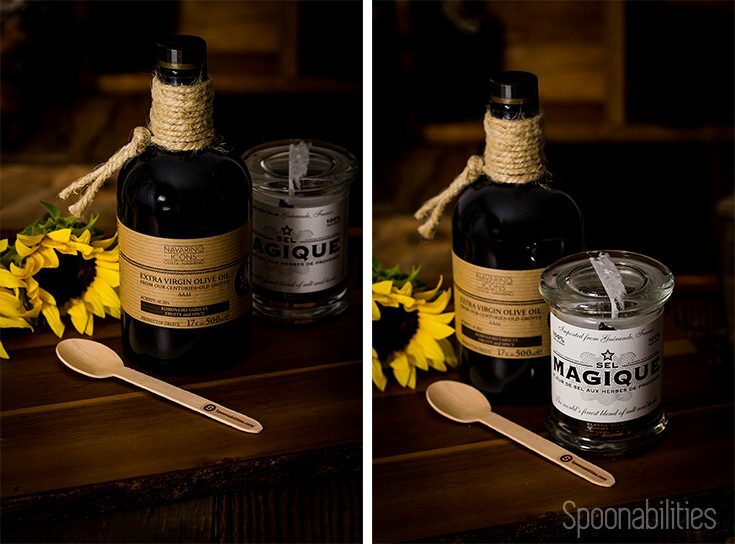 Do you find yourself struggling to know what to do with that lonely jar sitting in your refrigerator? Let me know what it is, and I will be very happy to give you suggestions and maybe even a new recipe to try out. The best kind of potatoes for baking are the ones that are high in starch and low in moisture. Starchy potatoes are not suitable for potato salads or any dish where you need them to hold their shape, because they break down quickly when cooked. Idaho potatoes or Russet potatoes are starchy potatoes that are the easiest option for you to find at your supermarket. 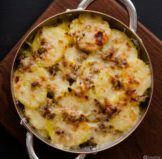 What recipes are best to make with starchy potatoes? With a starchy potato you can make baked potatoes, mashed potatoes, hasselback potatoes, potato pancakes or Latkes and also French Fries. Do not use starchy potatoes for potato salad, gratin recipes or casseroles. Very important to know that with this kind of potato, do not overwork them. Because of the high starch content they will become gummy and gluey. You don’t want that. This time I’m not going to highlight any important general health benefits of the potato. But I will say that there are other healthier vegetables that you could use instead of potatoes like sweet potatoes, Kohlrabi or celery root. One of my new favorite root vegetables is celery root and last month, I released a celery root recipe, in which I describe all the fantastic nutritional benefits of the celery root. As a side note, I LOVE potatoes ?. Do not store potatoes in the refrigerator because the starches will start to convert into sugar. The best way to store your potatoes are in a dry, cool, dark place in your pantry. Do not wrap the potato in tin foil when you bake it because the skin will become wet and soggy… unless this is what you want for a particular recipe. 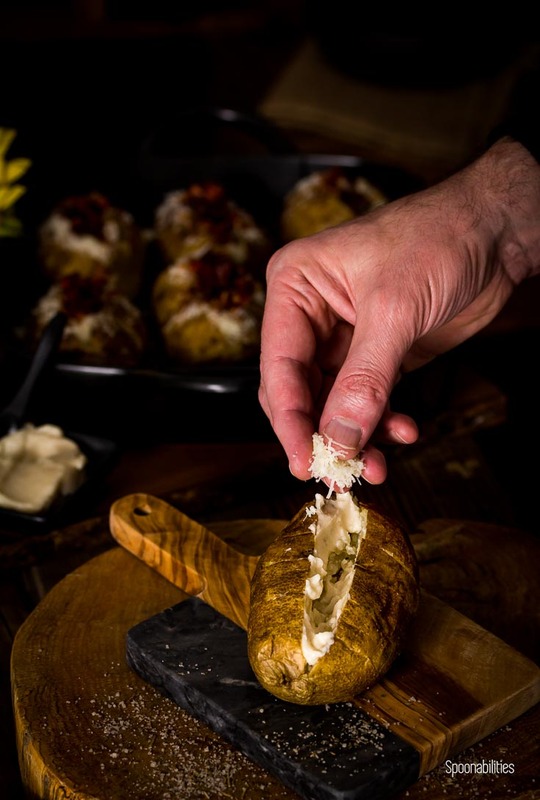 To make the baked potato, the first thing to do is wash the potato thoroughly with a scrub brush to remove any dirt. Then, dry the potato, and with a fork pierce all around the potato to prevent it from exploding in the oven. I haven’t actually tested to see if this really happens, but take my word for it as I’ve taken the word of others… better safe than sorry. 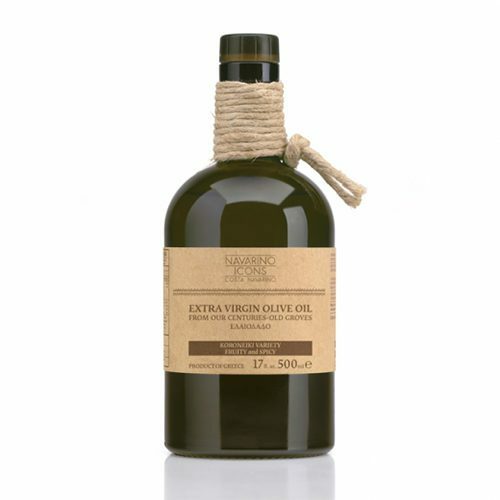 For a baked potato with a crispy skin, rub it with olive oil and sprinkle with salt. 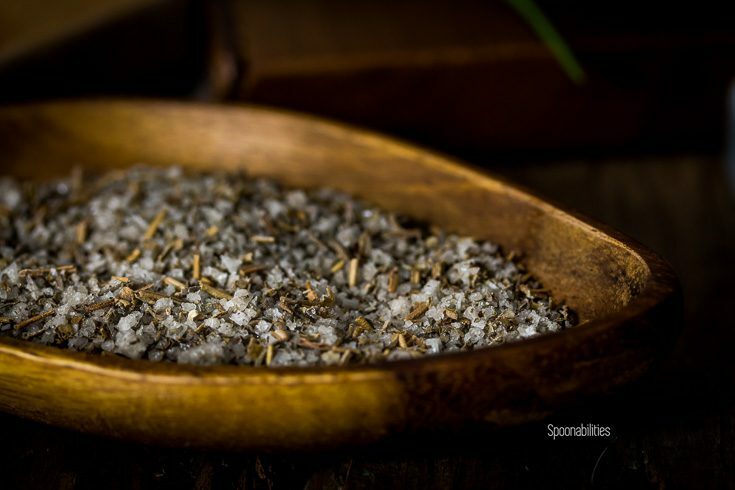 This is the key for a flavorful, crispy skin that most people overlook. For this recipe I used one of my favorite Greek olive oils called ELeon from Navarino Icons and the Fleur De Sel sea salt classic blend. 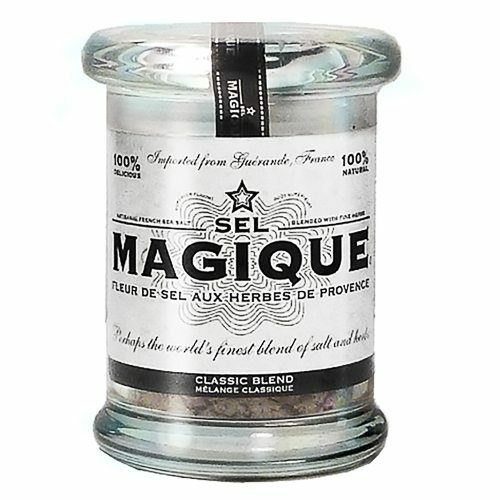 This classic blend of sea salt has Herbs De Provence including savory, thyme, marjoram, and lavender. 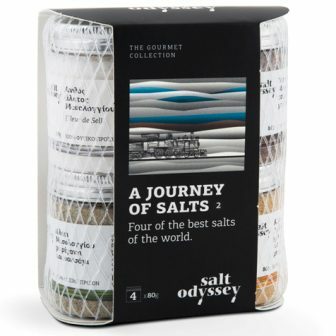 You can also use any flaky sea salt that you have in your pantry. Now, bake the potato in an oven at 350 degrees for 45 minutes. Take the potatoes out of the oven and wait until they cool enough that you can handle them. 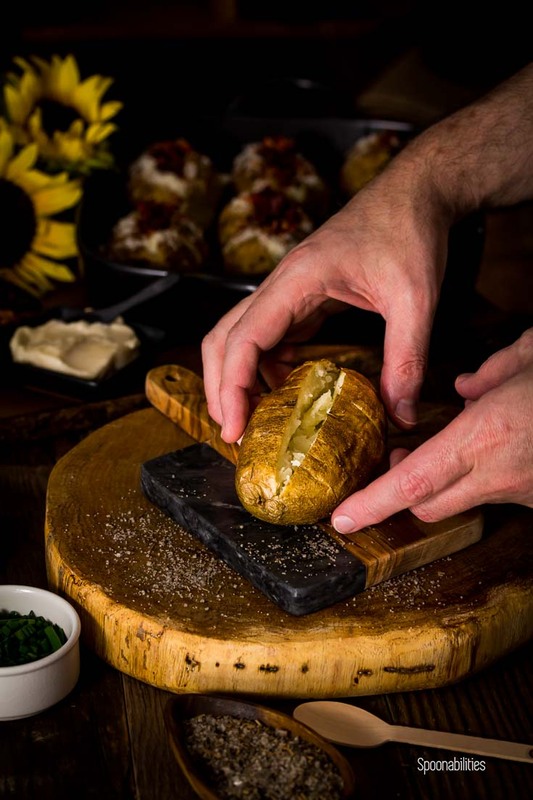 Make a cut on the top-center of the potato and holding the potato from both ends, push carefully and this will create a small crevice. Using a fork, scrape the meat of the potato to soften and loosen it up. Add a TableSpoon of aioli, grated Manchego cheese, and top with chopped spicy Ibérico longaniza chorizo sausage. In half of the potatoes, I added the longaniza chorizo, and in the other half I added some chopped lomo Ibérico pork loin. Then, return the stuffed baked potatoes into the oven and bake for another 15 minutes, or until they are heated through and the cheese melts. Top the baked potato with chopped chives. 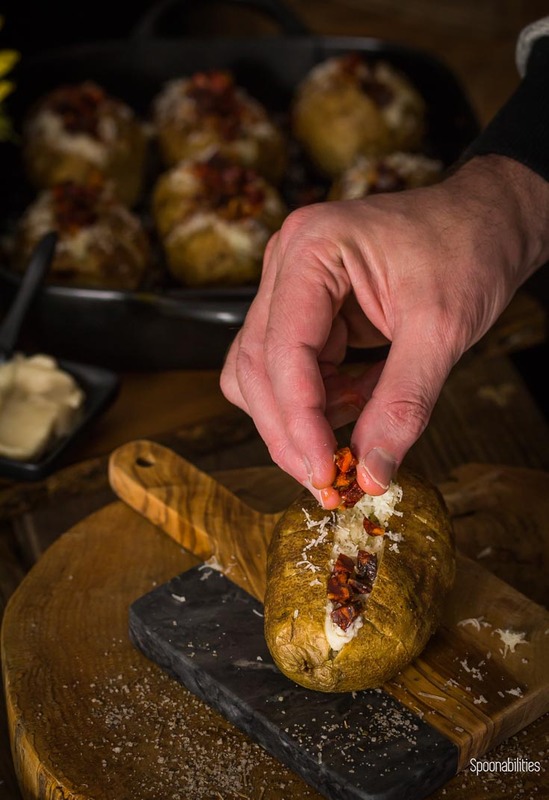 What toppings can you put on a baked potato? Mexican style baked potato: use toppings like Mexican Crema, roasted or fresh corn, Monterey Jack cheese, salsa verde, and chorizo. Also, create other combinations with chopped cilantro, chopped tomatoes, jalapeños, chopped red onions, avocado or guacamole. 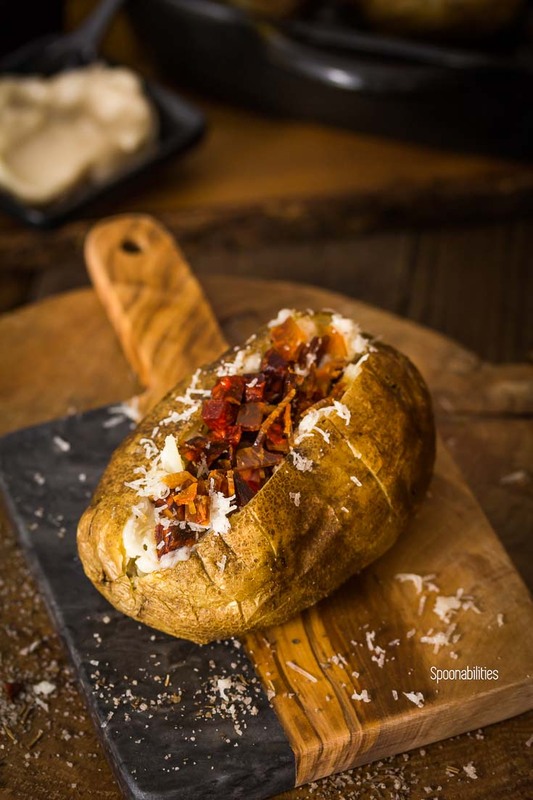 Greek style baked potato: use toppings like oregano, feta cheese, Greek yogurt, roasted red pepper spread or chopped roasted red pepper, Kalamata tapenade or chopped Kalamata olives. 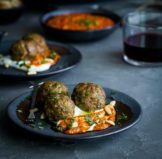 Middle Eastern style baked potato: use toppings like labneh cheese, za’atar, sumac, roasted eggplant, Aleppo pepper, chopped Kebab/kabobs or chopped kibbeh. 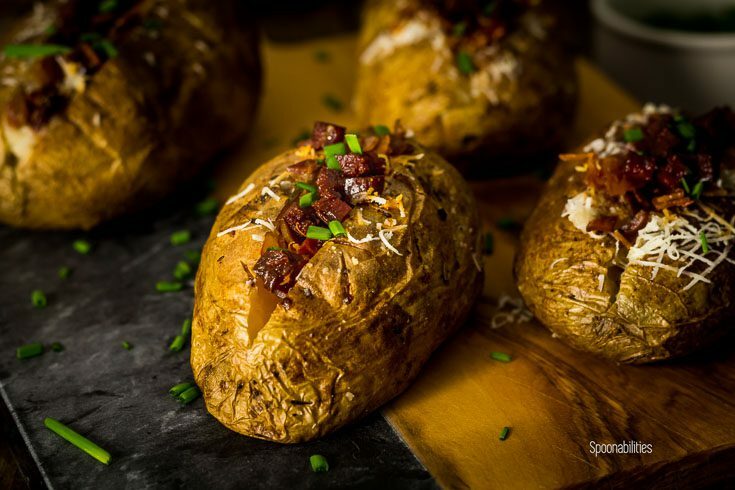 Italian style baked potato: use toppings like mascarpone cheese, chopped artichoke, prosciutto, truffle or any of these chesses: Parmigiano-Reggiano, fontina, or pecorino. French style baked potato: use toppings like crème fraiche, niçoise olives, ratatouille, gruyere cheese, caramelized onions or mushrooms. I’m pretty sure you guys will enjoy this Spanish style baked potato as much as I do. 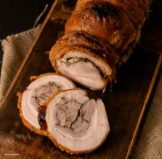 With a perfectly crispy skin, and a creamy and fluffy interior, this recipe will become a hit with your family or with your friends at that special dinner party. Spanish Style Baked Potato has a perfectly crispy flavorful skin with a creamy and fluffy interior. 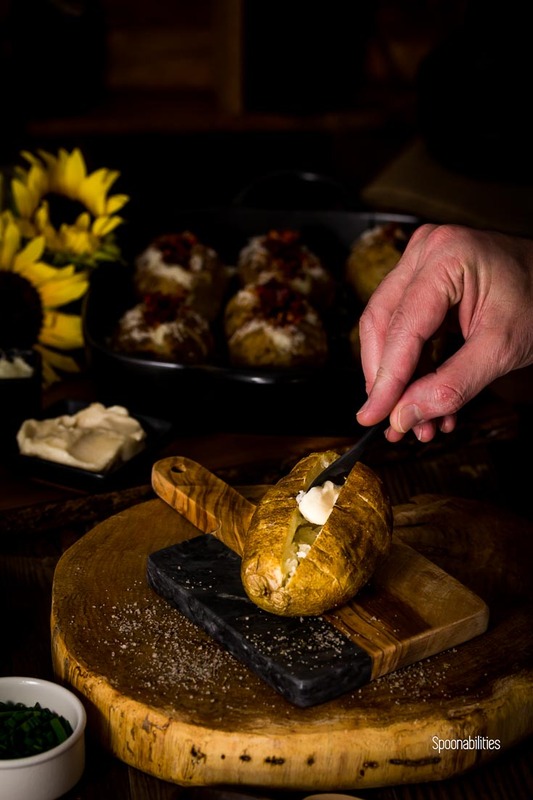 Bursting with delicious Spanish flavors, this double baked potato is the perfect comfort food loaded with different tastes from the aioli, manchego cheese, spicy ibérico longaniza chorizo sausage & Lomo Ibérico pork loin. 10 Idaho potatoes or Russet potatoes. 2 cups Spicy Ibérico Longaniza Chorizo Sausage by Fermin. Chopped in small cubes. Wash the potatoes with a scrub brush, and dry them. With fork, pierce potatoes as many times as you want. Bake them for 45 minutes. When the potatoes are cool enough to handle, make a cut on the top-center part. Holding from both ends, push carefully and this will create a small crevice. Using a fork, scoop the meat of the potatoes to soften and loosen it up. Scoop a TableSpoon of Aioli, follow with the Spicy Ibérico Longaniza Chorizo Sausage and top with grated Manchego cheese. Bake for another 15 minutes or until heated through and the cheese melts. As a garnish sprinkle on some chopped chives. You are very welcome Jessie! Let me know when you get to try how the potato turns out. You made my day Albert! Thank you so much for approving this recipe and for the compliment on the pictures. I love Spanish food. We love baked potatoes in our house. Such a great meal and everyone can top them slightly differently and make the meal their own. I love your philosophy for using up leftovers, such an important thing for us all to think about. Hi Clarie! Thank you for your feedback and glad to hear you like my ideas of different toppings. Yes, I love to use leftover ingredients and get creative. It’s also a money saving idea! Mmm love this twist on baked potato! Thank you Suzy! This baked potato is incredibly yummy! Mmmmmmmmmmmmm. Oh yeah. I never bake potatoes like this, but I’m going to now! Hi Mimi, This was my first time baking potatoes or stuffed potatoes. This dish is entertaining to put together! Such great ideas on how I can jazz up my next baked potato! Hi Lisa, I’m glad that you like my ideas. I hope you get to make one of those ideas soon. Thank you! I saw this recipe over on Pinterest and had to stop by to tell you how crazy delicious it looks! Pinning it..so I can make this over the weekend ?? Hi Soniya, Thank you so much for saving our recipe. I would love to see pictures and hear your feedback. I’m really excited reading your comment. 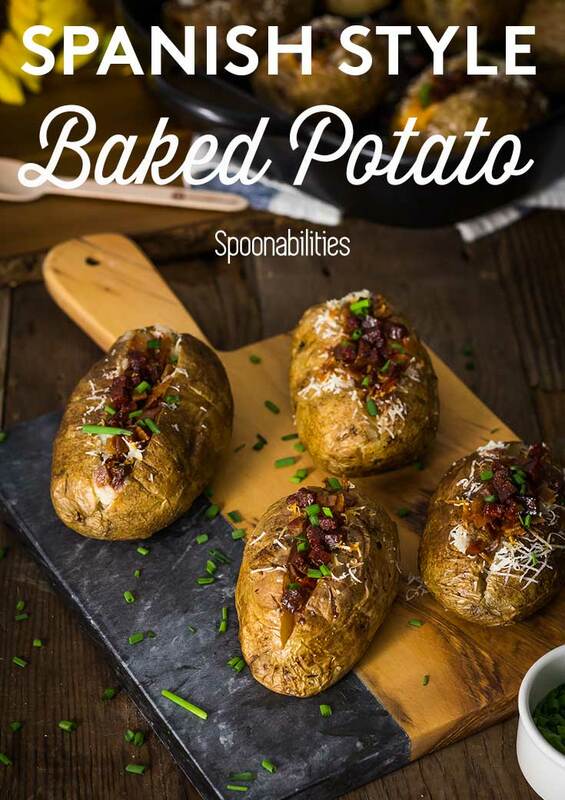 These baked potatoes look super fantastic. I am tempted to try this recipe asap. Thanks for an amazing share! Thank YOU Neha. Feel free. It’s always fun to give into temptation. Potatoes look really nice and tempting .. thanks for sharing the recipe and more so the pointers. will definitely try it soon..